The Dongshan River Water Park is an artificial canal that stretches to about 24 kilometers long. The riverbank is surrounded by green rice fields on both sides, creating a relaxing atmosphere amidst nature. The carefully designed riverside recreation area was developed to provide both local and tourists a place for sports, leisure and recreational activities in a truly scenic wide water land. The park was designed back in 1987 but was only officially opened to the public in 1994. The stream was divided into the upstream, midstream and downstream sections, with each exhibiting a different recreational appeal and character. Together, it then became the first outdoor water park of the Yilan County. The Donshang River Water Park was designed to rebuild the natural relationship between man and water. The water park simulates natural landscapes and blends in elements of the Lanyang native culture. Its various facilities were made to fulfill the purpose of tourism, leisure as well as education. To address such purposes, a water stage, conical stone towers made of pebbles and a Turtle Island that rises off the coast completes its look. The park is best enjoyed for its popular outdoor stage shows, an ecological reservation area, camping grounds, barbecue pits, its shallow pools where visitors can just wade in the water, and deeper areas where guests can rent row boats. Its most attractive spot is its Qinshui Park at the center section of the river. The Yilan county government is also planning the construction of an outdoor marine museum to boost its tourism business even more. 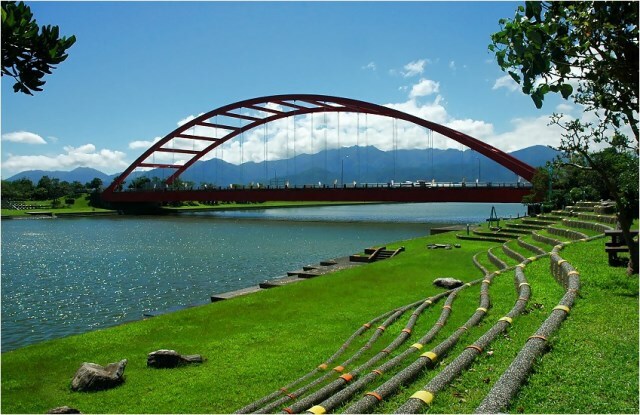 Although it only extends to about 24 kilometers, the Dongshan River is the 5th longest stream in Yilan County. Also known as the Dong Mountain River, the banks of the Dongshan River are said to be protected by two dragons, a green dragon and a yellow dragon. Because of the legend, waves and curves made of pebbles were built along the river banks to simulate the scales the two dragons. Ceramic tiles of a green and blue dragon as well as an orange and yellow dragon were made to represent the two different mystical creatures that continue to protect the river. Mosaic pictures of the seemingly dragon-skin steps were made by the school children of Lanyang. To add to the river park’s romantic charm, a Magpie Bridge was built. According to Chinese folklore, two lovers are permitted to meet once a year at the Magpie Bridge during Qizi Chinese Lovers Day. Now, you can imagine the influx of people during this day. Today, annual Dragon Boat Races, International Rowing Championships and the Festival for International Children’s Folklore & Folk Games are all held at the river park. But with or without these annual festivals, events and competitions, the Dongshan River attracts a large number of visitors. In recent years, the Dongshan River Water Park has come to be one of the most recommended tourist destinations of Taiwan especially during the swelling hot summer days. With its spacious natural area, splendid country side views and exciting water facilities, the Dongshan River Water Park certainly does not disappoint the flawless mixture of man and nature.